Medical errors happen sometimes. Linda Kenney almost died because of a simple medical mistake. The emotional impact on her healthcare providers were never addressed so she founded MITSS (Medically Induced Trauma Support Services) to help prevent medical mistakes and provide support for all those involved. 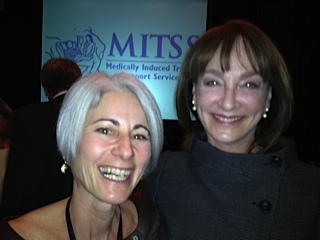 The year I attended an MITSS conference in Boston, I heard Dr. Nancy Snyderman speak. She is the chief medical editor for NBC News and surprising to me, a head and neck surgeon. She told an operating room story. During the Q&A it was brought up that she was a little harsh on this student. She responded with unwavering conviction and told the audience that nothing anyone says in the room would make her change her opinion. I could see her point and believed she was right. Here is a story about how Dr. Snyderman’s patient taught her a few lessons. Dr Snyderman is a powerful speaker and an admirable doctor and human being. It was an honor to meet her.